Last summer LAUSD shut down the Title 1 parent committees. These were the last representative links between parents and LAUSD. The Title 1 committees elected a representative that they sent to local district meetings. The local districts elected representatives to send to the Parents as Equal Partners Committee (also now shut down). Currently parent representatives are hand-picked by the district. Parents (up to 5) may still serve on each school's School Site Council (SSC) but their power does not extend beyond the school. At our SMALL school these 5 parents represent more than 2000 parents. 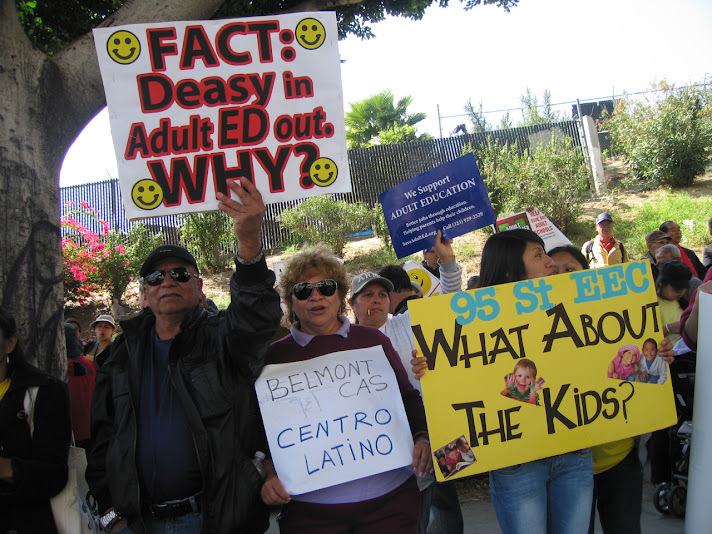 Monica Garcia and Robert D. Skeels, what would you do to restore meaningful parent participation at LAUSD? Robert D. Skeels: I'm submitting the following, but I'd like to know your thoughts first... that's the point isn't it? It's no coincidence that LAUSD eliminated the Title I DACs just before Deasy started raiding Title I and Title III funds for DIBBELS and other items associated with standardized tests. It's no secret that Maria Casillas's tightly controlled PEPAC were little more than venues for her junta to browbeat parents into going along with Deasy's heavy handed corporate reforms. However, it's shameful that they eliminated those bodies, even if they were little more than focus groups. The truth is that the District doesn't want genuine parental and community engagement, and there's no clearer evidence of this than we see abject incidents like the reconstitution of Crenshaw HS. We have to find ways to provide parents, families, and community members with authentic input and meaningful decision making. We need to increase the size of School Site Councils, and ensure that there are designated seats for Title I parents at schools with Title I status. We need to allow those bodies to elect their own representatives to participate in the new local districts, or whatever name Deasy calls them. Monthly the Superintendent and the appropriate board members (based on region) would be required to meet with those regional representatives on a rotating basis. The precise name, composition, and functions of these groups would be best worked out by those who would comprise them. Allowing the best ideas of stakeholders to help inform what these bodies would look like is the first step towards creating more democratic and authentic participation in the governance of the District. I think that the ESBMM model of governance is a good starting point on how these groups could look. That model provides stakeholders more decision making than any other I've seen. Lastly, I want to go on record as saying we want to encourage broader participation than just parents. Students, extended family, alumni, community members, and many others are often left out of these discussions. I like to say that while the schools serve the students and parents, they belong to the entire community. The conversation continued in the comments, with others contributing. However, the important part is that we are having a dialog about meaningful family and community participation. A conversation that needs to continue, and we need to better use LAUSD Adult Education as a powerful tool in the equation to promote more family and community engagement and empowerment in our schools.